Richard ‘the Nose’ Paterson is one of the whisky world’s most recognisable Master Blenders. He blends Scottish passion with unbridled energy and little sprinklings of surprises; and that’s just his personality we’re talking about here. Richard is a third-generation Master Blender in the whisky business, like his father and grandfather before him. He joined Whyte and Mackay in 1970, and has been with the company ever since. In five short years he became their Master Blender and soon earned himself a reputation as ‘The Nose’. He’s best known for his association with The Dalmore, and in recent times, The Dalmore’s ‘prestige’ or ‘ultra-premium’ whiskies. Just last year, he unveiled The Dalmore Paterson Collection: 12 whiskies, the oldest being a 1926 vintage, all inspired by people who in turn have inspired Richard throughout his career. Commissioned by Harrods in London, this treasure chest – a bespoke cabinet chest, to be exact – of liquid gold can be yours for a princely sum of £987,500. It’s still available, if you must know. And it’s for the premium whiskies that The Dalmore famously made the news in 2011, when at the first Masters of Wines and Spirits showcase, DFS Singapore sold back then what was the most expensive whisky ever in retail: a 62YO Dalmore from Richard’s personal collection (the last of the 62YOs) that went for S$250,000. The following year, a 1926 vintage priced at S$300,000 was sold shortly after the event. And in 2013, they presented a 1951 vintage from the Constellation Collection, priced at S$350,000. 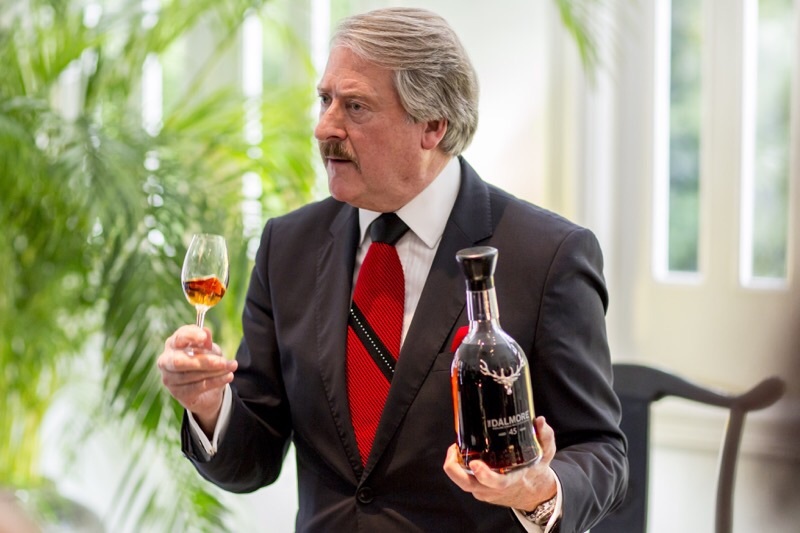 No surprises then, that Richard made an appearance at the recent Masters of Wines and Spirits showcase to unveil the new DFS-exclusive Dalmore 45YO whisky. A mix of vintages 1967, 1968, and 1969, the whisky was finished in Gonzalez Byass Matusalem Sherry and vintage port casks, and modestly priced – by Dalmore’s standards – at S$31,888. Thirty bottles have made available worldwide this time round. And of course, Richard isn’t readily available, so we wasted no time in posing questions to one of the most charismatic figures in the whisky business. [SS] How did you arrive at this 45YO expression for the DFS Collection? What was your inspiration? [RP] DFS has some of the finest whiskies in the world within their collection, so I had to provide something befitting. I spent a great deal of time in the warehouse at The Dalmore distillery sampling different aged casks before I eventually decided upon this assemblage of cask finishes. For me this whisky is simply stunning. [SS] Is this bottling exclusive to DFS? As DFS is predominantly Asian, was that a factor when fine-tuning the flavour profile? [RP] Yes, this bottle is exclusive to DFS. Every bottle I create is focused on flavour and retains the signature style of The Dalmore, which are oranges and rich chocolate. This whisky has been finished in Matusalem Sherry and a vintage port, which gives it delectable flavours of walnuts, coffee and sweet plums. [SS] Can you share how the working relationship with DFS started? [RP] We started working with DFS many years ago, predominately through our Travel Retail Sales team, and from there the relationship grew, and I began creating exclusive whiskies for them. [SS] Dalmore has had a reputation for ultra-premium whiskies, is this an important part of The Dalmore’s identity? [RP] It is important to us to always create beautiful and innovative whiskies that the luxury consumer will enjoy. This extends to every whisky we produce from our 12YO right up to our Constellation Collection – our team constantly strive for perfection across the range. [SS] How much rare stock does Dalmore have in the warehouses? Can we expect to see more 60 year old whiskies in future? [RP] I am under strict instruction to keep this a secret! I can say that we have some of the rarest and oldest stocks of any distillery, and that I am constantly looking at new cask finishes to keep our whiskies innovative and exciting for the consumer. You will just need to wait and see! [SS] I understand that you use different-shaped stills in the distillation process. How do the different shapes help you to attain the desired flavour characteristics? [RP] We have eight different stills at the distillery which vary in shape and size. Combined, these create a spirit with a stronger and more complex character that is unique to The Dalmore. Double matured, finished refer to the same process: whiskies that have spent time maturing in one barrel are filled into another barrel, usually of a different ‘type’ (e.g. ex-bourbon vs ex-sherry) and spends some time maturing in them as well. [SS] Your core range of whiskies are double-matured – is there a reason why you don’t do full-sherry expressions? Or full ex-bourbon for that matter. [RP] The mix of bourbon and sherry is what gives The Dalmore its signature style across all of our whiskies. I always use American white oak as a base and then I work from there to create innovative finishes and tastes. [SS] Do you have an ideal when you create your whiskies? Is there an interesting personality or characteristic that you feel should be in your whisky? [RP] I have worked with whisky for over 40 years now and I have a good, sound knowledge of what different casks bring to the spirit. I like to work with some of the finest sherry bodegas, wineries, and port houses in the world so that I have a selection of different woods to work from, all of which bring their own unique characteristics. [SS] To your mind, what should one feel when they drink a Dalmore? And what is the best way to drink it? [RP] I hope they feel content and proud. The Dalmore moment for me would be when they are celebrating their achievements with friends. Personally, I think the best way to drink whisky is to open a bottle and share it with friends. I would caution adding ice to whisky as this can often chill the beautiful liquid. Instead, I would recommend adding just a splash of water just to open up the flavours and aromas in the whisky. For a whisky as special as the 45YO, it should be drunk with respect. It should be slowly savoured in order to really understand how exceptional this whisky is. [SS] What’s the best food/cigar/chocolate pairing for your whiskies? You’ve been to Singapore several times, have you tried pairing our local fare with Dalmore? [RP] We have different pairings depending on which age or expression you are choosing. Generally I would always advise a dark chocolate 80% cocoa and a good cigar like a Partagas. When I travel, I very much enjoy local cuisine, and I’m constantly thinking of what would work well with our whiskies. For the launch event of the 45, we worked specifically with a chef based in Shanghai to help us to create an Asian menu that perfectly complemented the whiskies that were served. [SS] I love your videos/masterclasses on how to drink scotch (watch one here) as they really do leave a deep impression. Can you share how you came up with that routine? [RP] Thank you. For me, it’s about making whisky accessible for people, and a great way to do this is to get a good balance between education and entertainment. You need to be passionate about what you are telling people, and the delivery of that passion is key, which is why I try to deliver it in an interesting and unique way. It needs to be memorable for people to remember it. [SS] What is the origin of your nickname ‘the nose’? [RP] My nose is absolutely critical to the job I do. I can assess hundreds of whiskies everyday so a great sense of smell is vital. I think because I always have my nose in a whisky glass, that’s where the nickname came from. [SS] What is the most heavenly thing that your nose has ever had the pleasure to smell? [RP] Perfume. I love the different notes within perfumes. My absolute favourite is Chanel No. 5 – it is heavenly. 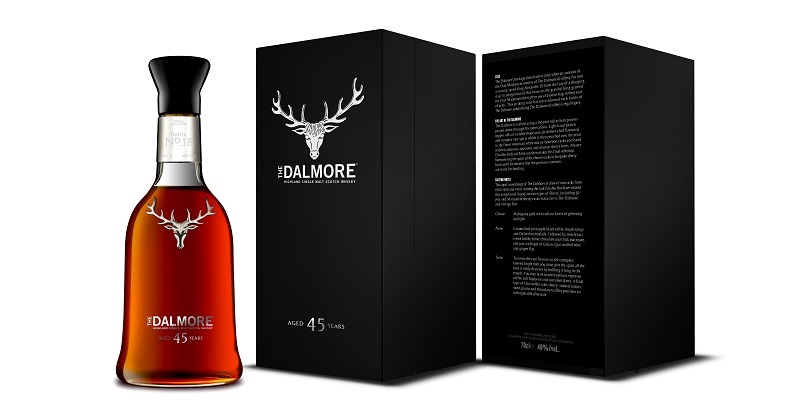 Only 30 bottles of The Dalmore 45YO will be available exclusively at DFS retail outlets at a recommended retail price of S$31,888.